Workplace Health & Safety: Promoting Environments Conducive to Well-Being and Productivity is the official publication of the American Association of Occupational Health Nursing, Inc. (AAOHN). It is a scientific peer-reviewed Journal. Its purpose is to support and promote the practice of occupational and environmental health nurses by providing leading edge research findings and evidence-based clinical practices. It publishes articles that span the range of issues facing occupational and environmental health professionals, including emergency and all-hazard preparedness, health promotion, safety, productivity, environmental health, case management, workers' compensation, business and leadership, compliance and information management. Workplace Health & Safety: Promoting Environments Conducive to Well-Being and Productivity, a scientific peer-reviewed journal, is the official publication of the American Association of Occupational Health Nursing, Inc. (AAOHN). The goal of WH&S is to support the mission of AAOHN which is to ensure that occupational and environmental health nurses are the authority on health, safety, productivity and disability management for worker populations. AAOHN achieves its mission by providing education, research, public policy, and practice resources for occupational and environmental health nurses through education and research, professional practice, ethics, communications, governmental issues, and alliances. Workplace Health & Safety (WH&S) is the official journal for the American Association of Occupational Health Nurses, Inc. (www.AAOHN.org). WH&S is published by SAGE Publishing. WH&S is a peer-reviewed journal that follows the publishing standards set by the International Committee of Medical Journal Editors (http://www.icmje.org/), the Committee on Publication Ethics (COPE) (https://publicationethics.org), and SAGE Publishing (https://us.sagepub.com/en-us/nam/manuscript-submission-guidelines#Authorship). The goal of WH&S is to support the mission of AAOHN which is to ensure that occupational and environmental health nurses are the authority on health, safety, productivity and disability management for worker populations. AAOHN achieves its mission by providing education, research, public policy, and practice resources for occupational and environmental health nurses through education and research, professional practice, ethics, communications, governmental issues, and alliances. The benefits offered to AAOHN members can be found at http://aaohn.org/page/member-benefits. WH&S welcomes the submission of original manuscripts of interest to occupational and environmental health nurses that are aligned with AAOHN’s Research Priorities (http://aaohn.org/d/do/1701) and Standards of Practice (http://aaohn.org/p/pr/vi/prodid=3) that include original research, literature reviews, professional practice (clinical reports, leadership and management, legal/regulatory, successful programs), current topics, editorials, and letters to the editor. International submissions are welcome, but must relate to the mission of WH&S and meet the WH&S standards for manuscript preparation. Non-native English writers are encouraged to seek an expert in translation to assist with the manuscript’s development before submission, if needed. Editorial services are not provided by WH&S editors. Authors who feel that their papers could benefit from being edited for matters of grammar and language, are welcome to explore SAGE Language Services which offers a fee-for-service option to have their papers edited by a professional, experienced editor. Completion of the editing service does not guarantee manuscript acceptance by WH&S. All journal articles must conform to the Manual of the American Psychological Association (APA), 6th ed. (2010). Details about APA referencing style is included throughout this document and at the APA website (https://www.apa.org) including the APA blog (https://www.apastyle.org). Authors are encouraged to familiarize themselves with WH&S prior to submission. Query letters should be sent via email attachment in a Microsoft Word formatted document. All queries should include one to two paragraphs that describe the manuscript including the purpose of the professional practice project, research study or current topic, the worker population and the approach employed. In addition, please indicate the details about the study team and setting. Please do not send the manuscript; rather, send your query to the editor designated for the manuscript type that you are inquiring about, as outlined in the table below. Professional Practice: These are reports about the innovative application of professional practice initiatives as they pertain to occupational health nursing practice, education and research. Topics could include: development and implementation of occupational health and safety programs; monitoring health of employees with special focus on assessment, diagnostic, and therapeutic interventions; development of disease-prevention programs such as smoking cessation, weight management, exercise, and nutrition; Total Worker Health™ (physical, mental, psychosocial); global health; case management; hazard assessment of workplace exposures and management/changes made within the work environment based on evidence/findings; communicable disease/infection control; implementation of disaster preparedness programs; research on workplace exposures; occupational health and safety regulations; special worker populations (e.g., hard to reach workers, aging workers); collaborative work with other professions to improve health outcomes for employees ethics, and more. Abstract: This should be structured with the following subheadings: Background, Methods, Findings, Discussion, Conclusion, and Application to Professional Practice. Please include the abstract in the body of the manuscript, in addition to providing it in the ScholarOne system (the online manuscript submission portal). Background: Provide the reader with what is currently known about the topic. State the problem/gap in practice with supporting literature/research as a basis for the project. Relevance to occupational and environmental should be stated. The purpose statement should be made at the end of the Background section. Project/Program Methods: Explain to the reader the specifics of the professional practice innovation, with attention to the assessment, plan and execution of the project as it was implemented in the occupational health setting. This should include the methods employed for performance/outcome innovation. We suggest ordering this section as follows: an overview description of the project/initiative; a description of the intervention/program; a description of the worker population involved and how they were invited or included; a description of the data collected and how it was collected; and how the data were analyzed. Discussion: This section should discuss the more relevant findings. Describe strengths and limitations of this professional practice, and include implications for additional opportunities for innovation. Conclusion: Summarize the content, linking the Introduction to the Findings. Restate the implication for using this professional practice. Applications to Professional Practice Insert/Box: This includes a 150-word summary of the professional practice innovation as it applies to occupational health and environmental nursing practice. This is different from the Abstract and does not include sub-headings. The Insert/Box is a very brief narrative description of the project. Original Research: A report of an original research study (quantitative, qualitative, mixed-methods) includes the following sections: background, methodology, results, discussion, and implications for occupational health nursing practice/implications for occupational health practice. Authors submitting observational research reports are encouraged to follow the STROBE checklist. Abstract: This should be structured with the following subheadings: Background, Methods, Findings, Conclusions, and Application to Practice. Please include the abstract as the first page in the body of the manuscript, in addition to providing it in the ScholarOne system (the online manuscript submission portal). Background: This should include an overview or the epidemiology of the issue, as well as details about the gap in the literature that the research intended to address. The purpose of the study (e.g., purpose, aims, and/or hypotheses) should be stated in paragraph format at the end of the Background section. This should also include something about the relevance to occupational and environmental health nursing. Methods: This should include an introductory paragraph describing the overall approach of the study, study design and study setting. This should be followed by sub-sections including: the study population and recruitment/sampling of participants (including methods employed for obtaining informed consent, if applicable); the study protocol, including the data collection methods and instruments, and the construction of study variables; data analysis which should provide a chronological description of the data management and analysis approach including descriptive statistics (e.g., frequencies, means, standard deviations), as well as inferential statistics (e.g., Student’s t test, ANOVA, linear/logistic regression). The inferential statistics employed should include a description of the measures of effect that were calculated (e.g., odds ratio; 95% confidence interval; etc.). The data analysis should include a description of the approaches used for all data presented in the data tables. Results: This should include a description of the participants (their rate of participation), descriptive findings of participants, descriptive findings about the main study exposures, explanatory variables, and outcome(s) followed by findings of inferential analyses. For qualitative studies that include participant quotes, please include the quotes within the body of the text (rather than separating the quotes by placing them in stand-alone tables). Quotes must be structured and referenced according to the APA Guidelines; https://blog.apastyle.org/apastyle/direct-quotations/. Discussion: This should include a comparison of study findings with the current and relevant literature. This section should not repeat the study findings in its entirety, or report numeric findings. This section should highlight the salient, more relevant findings, along with an integration of the current literature. In addition, it should discuss the implications for further research and education. Implications for Occupational Health Nursing Practice or Implications for Occupational Health Practice: This should provide the reader with information regarding how the study findings are relevant to current occupational and environmental health practice, including how the findings can be reasonably applied to the frontline occupational health nurse or other occupational health practitioner. Applying Research to Occupational Health Practice Insert/Box: This includes a 150-word summary that provides a brief overview of the findings and how the findings apply to occupational health nursing practice or general occupational health practice. This is different from the Abstract and does not include sub-headings. The Insert/Box is a brief narrative description of the project. Brief Report: This article format is ideal for presenting pilot research findings, and pilot professional practice programs. These are short reports in which the findings are preliminary and/or narrowly focused. Please refer to the descriptions for Professional Practice and Original Research for more details on the manuscript outline and approach. Background: This should include an overview of the issue and research question. Methods: This should include a description of the literature search conducted (i.e., keywords, criteria for inclusion and exclusion) and a description of how the review of manuscripts was conducted. Results: This should include tables that provide a summary of the findings from the included articles. The tables should include, at a minimum, the primary author’s last name, year of publication, study population and sample size, primary outcome(s) measured, explanatory variables, and findings. Table details should stand alone with regard to completeness. Discussion/Conclusion: This should include a synthesis and integration of findings of the reviewed literature. The manuscript should provide conclusions based on the review and recommend new approaches for occupational and environmental health nursing practice, research, and/or education. Tables: Evidence tables that outline the selected research articles should be included. Tables should include details about the following: author/year, study population, primary exposures/interventions and primary outcomes considered, covariates considered, main findings, and quality of the study. In Summary Box: This box includes 3 to 4 bulleted sentences that cover the salient professional practice findings. Clinical Case Report: A succinct report of a clinical case affecting or involving occupational and environmental health nursing. This clinical case should reference established professional clinical practice guideline(s) relevant to the clinical case. We recommend following the CARE Case Report guidelines, which offers templates for structuring the report that can be found at: https://www.care-statement.org/case-report-writing-template.html. The structure of the report should include the following: introduction, worker/patient information, clinical findings, timeline, diagnostic assessment, therapeutic intervention, follow-up and outcomes, discussion, worker/patient perspective (if obtained), and informed consent, if obtained). Current Topics: This back-page manuscript of WH&S focuses on a specific current topic relevant to occupational and environmental health nursing or occupational safety and health that is addressed in a single page. This article hits the salient points of the topic while providing the reader with relevant and up-to-date references for further inquiry. 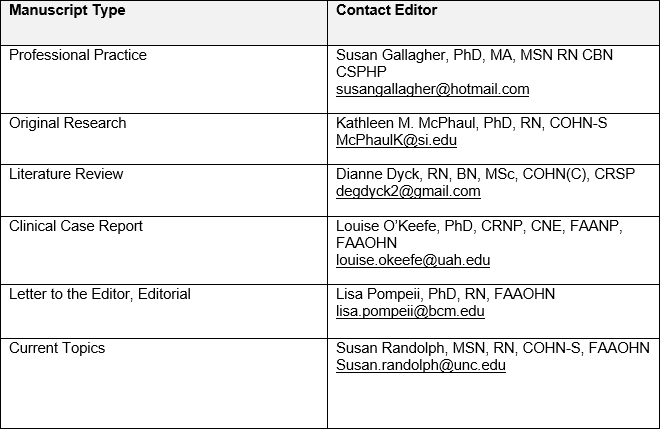 Letter to the Editor or Editorial: These features should pertain to previously published articles or other topics relevant to occupational and environmental health nursing. Letters/editorials are not processed through the WH&S peer-review system and should not be used as a substitution for a peer-reviewed manuscript. Submit letters and editorials through the online ScholarOne system. Do not email letters or editorials directly to the editing team. Text, tables and figures must be in Arial font, pt. 11 throughout. The main text must be double-spaced throughout with left margin alignment, including acknowledgments, abstract, text, references, and figure legends. The tables may be single spaced. All pages should be numbered. Submit the title page as a separate file from the main text document. Include the author(s) names and credentials (e.g., PhD, MA, CDE, etc.). Do not use titles (Dr., Ms., Mr.). Also include a short, 1- to 2-sentence biography for each author (this applies for all article types, except for the Current Topics and Letters to the Editor submissions). For the corresponding author only, provide the contact email, phone number and physical mailing address. Provide the author contribution/biographies (no more than 1-2 sentences for each) (for guidance refer to: http://www.icmje.org/recommendations/browse/roles-and-responsibilities/defining-the-role-of-authors-and-contributors.html). Conflict of Interest (see the section on the Declaration of Conflicting Interests below). Figures should not be included in the main text; rather they should be uploaded as separate files (please refer to the instructions below). All pages should include line numbering. (In Microsoft Word, under the “Layout” tab, select “Line Numbers” that “Restart on Each Page”). WH&S requires a structured abstract of no more than 250 words for Professional Practice, Original Research and for Literature Reviews, and 150-word structured abstract for Brief Reports. Unstructured abstracts are required for Case Reports (150 words) and Current Topic articles (1-2 sentences). Please refer to the instructions for the respective article format for detailed instructions on the required abstract structure. Authors should list at least 3 to 5 keys words (no more) at the end of the abstract for all paper types except for the Letters to the Editor and Editorials. Professional Practice, Original Research, Brief Report and Literature Review articles have defined main headings as described above in their respective sections. Authors are welcome to include additional sub-headings relevant to the article type and topic. Authors are expected to provide accurate and proper sourcing throughout their document. Primary sources should be used. Manuscripts must conform to the guidelines for manuscript preparation as per the Publication Manual of the American Psychological Association, 6th ed. (2010). Additional details can be found in the APA Blog. The authors are responsible for the accuracy of references. The following includes examples of in-text APA citations, followed by APA formatting for the reference list. The reference list should be in alphabetical order by author and same-author references should be in chronological order. Up to six authors should be listed followed by “et al” for the remaining authors. Crews, D. W., Gartska, W. R., Yoo, M.-H., Kalter, R. J., Owen, B. J. C., Doe, R. T., Jr., et al. (1981). The physiology of the garter snake: An analysis. Scientific American, 245, 158-159. Voet, D., & Voet, J. G. (Eds.). (1990). Basic biochemistry (3rd ed.). New York: J. Wiley. at the annual meeting of the Association of American Medical Colleges, Washington, DC. Schwartz, J. (2004, September 5). Always at work and anxious: Employees’ health is suffering. The New York Times, pp. A1, A23. (5th ed., text revision). Washington, DC: Author. Number the tables consecutively using Arabic numbers. 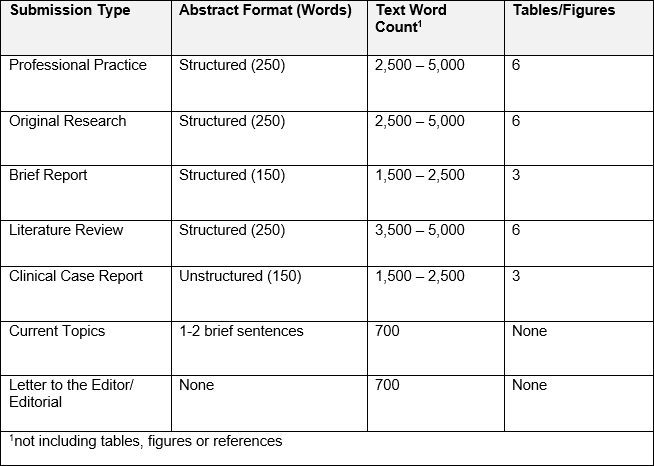 Table titles should be brief, but describe the content of the table, the population to which the table refers, and other pertinent information (e.g., sample size, study year), so that the table is interpretable by the reader with minimal reference to the text. Tables should adhere to the APA formatting outlined in the Publication Manual of the American Psychological Association, 6th ed. (2010). Additional details can be found in the APA Blog. Notes and footnotes for the table should be typed immediately below the table. The notes section begins with the word “Note” and a period (e.g., Note.). This section first includes general notes including abbreviations, followed by footnotes (e.g., superscript letters a, b, c as reference marks; do not superscript in the Notes section). The p-values appear last, beneath the footnotes, and use corresponding asterisks (*p<.05) with table data. Permissions for Previously Published Tables, Photos, Illustrations: Authors must inform SAGE if tables, photos, or illustrations have been previously published, whether by the author or another entity. Authors are responsible for obtaining permission from copyright holders for reproducing any illustrations, tables, figures, or lengthy quotations previously published. For further information including guidance on fair dealing for criticism and review, please visit our Frequently Asked Questions on the SAGE Journal Author Gateway. Content from the U.S. government websites (e.g., NIH, CDC, USDHHS) is in the public domain and generally can be used without permission. However, some content on these sites may be from another source, in which case, permission must be obtained from the copyright holder. If photographs are submitted with a manuscript, permission to publish must be obtained in writing from all the pictured individuals. Drawings or computer-generated images submitted with a manuscript require permission to publish from the artist. If academic, hospital, or business affiliations are given, or are referred to in the manuscript, it is the responsibility of the author to obtain permission from the proper authorities to use their name. All letters of permission should be submitted with the manuscript. If applicable, authors should describe the role of the study sponsor, if any, in the study design; collection, analysis, and interpretation of data; writing the report; and the decision to submit the report for publication. If the supporting source had no such involvement, the authors should so state that fact. If applicable, authors must declare whether they had assistance with study design, data collection, data analysis, or manuscript preparation. If the manuscript reports on a registered clinical trial and has been assigned a trial registration number from a public trials registry, authors must provide that information. Figures should not be included in main text; rather uploaded as separate files. Figure legends (titles) should not be included in the figure. Include figure legends in the main text, after the tables. Figures: Please use the following formatting for all figures. Arial Font, size no smaller than 9 pt. Digital images should be of high resolution (at least 300 dpi) and saved in JPEG or TIFF format. Figure legends should not be included in the figure. The figure legend should be included in the main document (see above). Figures/Images embedded in Word files and PowerPoint® slides are not acceptable. The figure legends should not be included in the graphic files. Arial Font, size 11 pt. This is an optional section that should be no longer than two lines for the acknowledgement of contributing colleagues (non-authors) to the submitted work. the funding agency and provide the grant number (if applicable). If no funding was received, then indicate that the work was conducted without external funding. Manuscripts are considered for review with the understanding that they are submitted solely to WH&S and have not been previously published. Authors must indicate during the submission process if they have a financial interest in, or serve as a consultant, reviewer, or evaluator for any product or company mentioned in the article. Manuscripts meeting the stated guidelines undergo blind, peer review by the Editorial Review Panel. Following this review, the author will be notified of the publication decision. For more information, contact the editorial office at drew.editorialasst.whs@gmail.com. Please note that the Journal does not accept submissions of papers that have been posted on pre-print servers. Peer Review Policy: WH&S adheres to a double-blind reviewing policy in which the identity of both the reviewer and author are always concealed. Before submission, please remove any identifying information about the authors from the main body of the text. Authorship: Papers should only be submitted for consideration once consent is given by all the contributing authors. Those submitting papers should carefully check that all who contributed to the paper are acknowledged as contributing authors. On the title page, the list of authors should include all those who can legitimately claim authorship. This is all those who: 1) made a substantial contribution to the concept and design; 2) acquired the data or analysis and interpreted the data; and 3) drafted the article or revised it critically for important intellectual content, and approved the version to be published. Recommendations for the Conduct, Reporting, Editing, and Publication of Scholarly Work in Medical Journals is addressed in: International Committee of Medical Journal Editors (http://www.icmje.org). Research Ethics: All papers reporting animal and human studies must include whether written approval to conduct the study was obtained from the Ethics Committee or Institutional Review Board of the author’s institution. Please ensure that you have provided the full name and institution of the review committee; as well as the Ethics Committee reference number. We accept manuscripts that report on human and/or animal studies for publication only, if it is made clear that the investigations were carried out in accordance with high ethical standards. Studies using humans, which might be interpreted as experimental (e.g., controlled trials), should conform to the Declaration of Helsinki https://www.wma.net/what-we-do/medical-ethics/declaration-of-helsinki/, and the typescripts must include a statement that the research protocol was approved by the appropriate ethical committee. In line with the Declaration of Helsinki 1975, revised in Hong Kong 1989, we encourage authors to register their clinical trials (and other suitable databases identified by the ICMJE, http://www.icmje.org). If your trial has been registered, please state this on the Title Page. When reporting experiments on animals, indicate on the Title Page which guideline/law on the care and use of laboratory animals was followed. Patient/Participant Consent: Authors are required to ensure that the guidelines from the International Committee of Medical Journal Editors (http://www.icmje.org), Recommendations for the Conduct, Reporting, Editing, and Publication of Scholarly Work in Medical Journals, are followed. Any identifying information about patients/worker participants must be excluded from the manuscript. For research studies, authors must provide written details in the manuscript about how informed consent from the participants was obtained. Research Data: At SAGE we are committed to facilitating openness, transparency and reproducibility of research. Where relevant, The Journal encourages authors to share their research data in a suitable public repository subject to ethical considerations and where data is included, to add a data accessibility statement in their manuscript file. Authors should also follow data citation principles. For more information please visit the SAGE Author Gateway, which includes information about SAGE’s partnership with the data repository Figshare. Funding: WH&S requires that authors acknowledge their funding for the submitted manuscript in a consistent fashion, under a separate heading. Please visit Funding Acknowledgements on the SAGE Journal Author Gateway to confirm the format of the acknowledgment text, in the event of funding, or state in your acknowledgments that: ‘This research received no specific grant from any funding agency in the public, commercial, or not-for-profit sectors’. Declaration of Conflicting Interests: It is the policy of WH&S to require a declaration of conflicting interests from all authors thereby enabling a statement to be carried within the paginated pages of all published articles. Please include any declaration at the end of your manuscript, after any acknowledgements are made and prior to the provision of the references, under a heading ‘Conflict of Interests’. If no declaration is made, the following will be printed under this heading in your article: ‘None declared’. Alternatively, you may wish to state that ‘The Author(s) declare(s) that there is no conflict of interest’. When making a declaration, the disclosure information must be specific and include any financial relationship that any authors of the article has with any sponsoring organization and the for-profit interests the organization represents; and with any for-profit product discussed or implied in the text of the article. Any commercial or financial involvements that might represent an appearance of a conflict of interest, need to be additionally disclosed in the covering letter accompanying your article, to assist the Editor in evaluating whether enough disclosure has been made within the Declaration of Conflicting Interests provided in the article. For more information, please visit the SAGE Journal Author Gateway. Revisions: If a revision is requested, please follow all original submission guidelines. Authors are required to provide a marked version of the revision indicating changes (track changes, colored text, or highlighting are all acceptable marking methods) and a detailed Response to Reviewer comments. Ideally, authors will respond to the comments from the reviewers/editors in the manuscript (e.g., using the reply to comment feature). Please do not submit a clean copy (without track changes/highlighted changes) of the manuscript for resubmission. Proofs: When an article has been accepted, SAGE publishing will email the author a copy of the manuscript proof, along with instructions. Accepted manuscripts are copyedited by the publisher, who will not check the typeset proofs for errors. It is the responsibility of the primary author to review the proofs carefully for spelling and grammar errors, accuracy of data findings, accuracy of citations and references, etc. The quality of the article presentation with regard to these elements is dependent on the primary author. Proofs must be returned to the publisher within 48 hours of receipt. Contributor’s Publishing Agreement: Before publication, SAGE requires the author as the rights holder, to sign a Journal Contributor’s Publishing Agreement. SAGE’s Journal Contributor’s Publishing Agreement is an exclusive license agreement which means that the author retains copyright in the work, but grants SAGE the sole and exclusive right and license to publish for the full legal term of copyright. Exceptions may exist where an assignment of copyright is required, or preferred, by a proprietor other than SAGE. In this case, copyright in the work will be assigned from the author to the society. For more information, please visit our Frequently Asked Questions on the SAGE Journal Author Gateway. WH&S and SAGE take issues of copyright infringement, plagiarism, or other breaches of best practice in publication, very seriously. We seek to protect the rights of our authors and we always investigate claims of plagiarism or misuse of articles published in the journal. Equally, we seek to protect the reputation of the journal against malpractice. Submitted articles may be checked using duplication-checking software. Where an article is found to have plagiarized other work, or included third-party copyright material without permission or with insufficient acknowledgement, or where authorship of the article is contested, we reserve the right to take action including, but not limited to: publishing an erratum or corrigendum (correction); retracting the article (removing it from the journal); taking up the matter with the head of department or dean of the author’s institution and/or relevant academic bodies or societies; banning the author from publication in the journal or all SAGE journals; and/or pursuing appropriate legal action. The collection of ORCID IDs from corresponding authors is now part of the submission process of this journal. If you already have an ORCID ID, you will be asked to associate that ORCID ID to your submission during the online submission process. We also strongly encourage all co-authors to link their ORCID ID to their accounts in our online peer review platforms. It takes seconds to do: click the link when prompted, sign into your ORCID account and our systems are automatically updated. Your ORCID ID will become part of your accepted publication’s metadata, making your work attributable to you and only you. Your ORCID ID is published with your article so that fellow researchers reading your work can link to your ORCID profile and from there link to your other publications. Information required for completing your submission: You will be asked to provide contact details and academic affiliations for all co-authors via the submission system and identify who is to be the corresponding author. These details must match what appears on your manuscript. The affiliation listed in the manuscript should be the institution where the research was conducted. If an author has moved to a new institution since completing the research, the new affiliation can be included in a manuscript note at the end of the paper. At this stage, please ensure you have included all the required statements and declarations and uploaded any additional supplementary files (including reporting guidelines where relevant). SAGE Production: Your SAGE Production Editor will keep you informed as to your article’s progress throughout the production process. Proofs will be made available to the corresponding author via our editing portal SAGE Edit or by email, and corrections should be made directly or notified to us promptly. Authors are reminded to check their proofs carefully to confirm that all author information, including names, affiliations, sequence and contact details are correct, and that Funding and Conflict of Interest statements, if any, are accurate. Please note that if there are any changes to the author list at this stage all authors will be required to complete and sign a form authorising the change.